Immediately off of the trailer, Robbye was…out of control. Her anxiety just completely takes over her, and she can’t focus on me to save her life. She doesn’t bolt or kick, but she completely ignores me, screaming and trotting in circles, to the point of running into and over me. That’s just absolutely not acceptable for any horse, much less for one as big as her. And she was so distracted and nervous that I couldn’t get a chain over her nose to be able to control her. I have lots of “lessons learned” from this trip, and one is that I’m going to put the chain on in the trailer, right before she gets off, from now on. She respects the chain and I usually only have to bop her with it once, so…it’s worth it for my safety. Ordinarily at this point at a show I’d tie Rob to a trailer and let her scream herself silly. Well I’m trying to learn from you all, and not just from the people I watch in real life, and I know many of you use hand-walks to calm your horses at strange locations. Why have I always just left Robbye to cry herself silly? Probably because I was busy crying MYSELF silly! But the hand-walking worked very well; as we made our way among the trailers and lots of sane, happy horses, Robbye inched away from insanity and back toward grazing and her usual cold-bloodedness. By the time we got back to the trailer she was only crying once in a while, and was willing to eat hay like the big girl she is. The pace course was gorgeous. Anyway, I know this is all super riveting, but it was actually a great break-through for both of us! 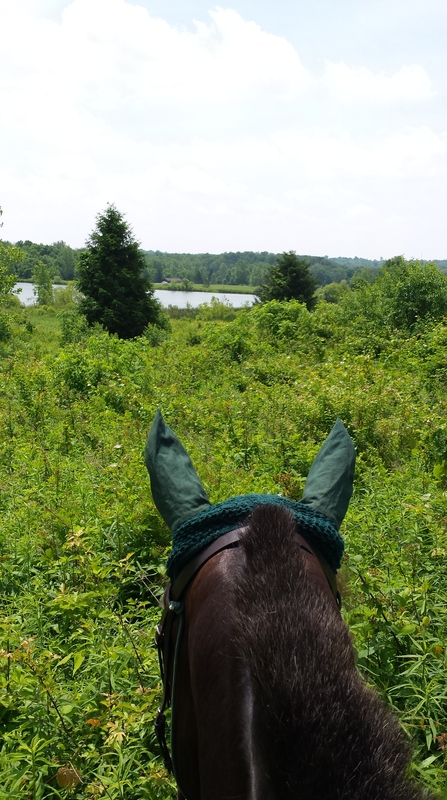 I had decided, knowing that there would be an empty dressage court, a warm up arena looking a lot like a stadium course, and a hunter pace covered in cross country jumps, that I was going to pretend this was a horse trial. So we tacked up for dressage, then proceeded to absolutely rock our “dressage test”. Sane horses can eat at the trailer. This is the first time ever that I’ve been able to replicate our under saddle work away from home. Ever. And considering the way this day started – completely out of control – I am absolutely thrilled. She was round, forward, willing, and happy. 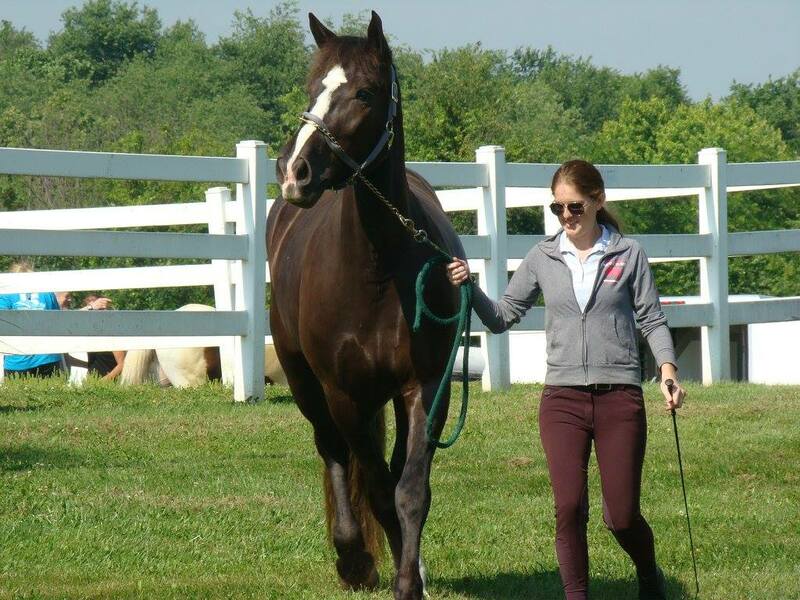 I felt confident, brave, and really really proud of my horse. 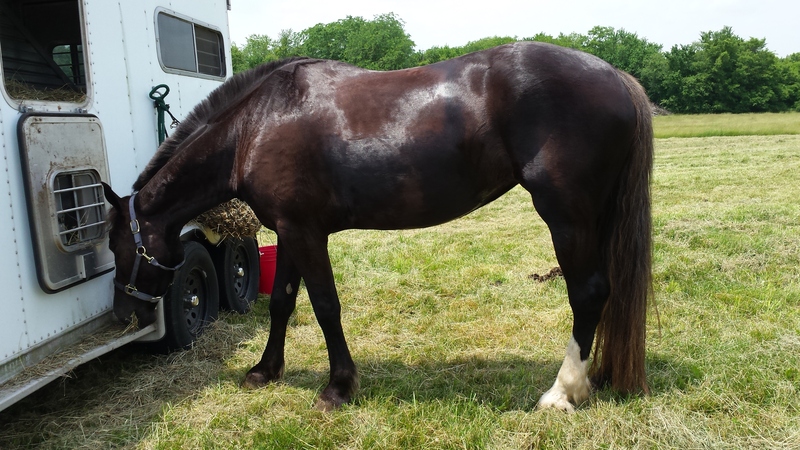 After a long dressage school, we walked straight through the trailer parking – with zero drama! – and popped over the warm up jumps for our “stadium round”. 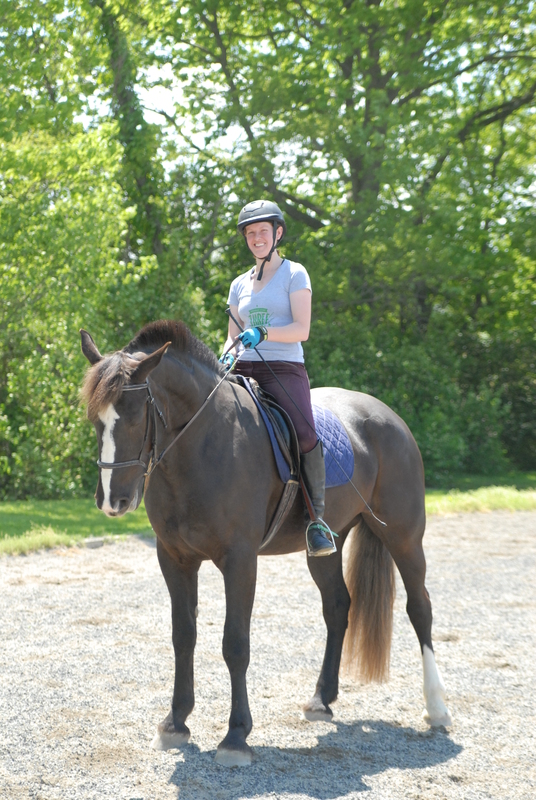 They were only about a foot high, and I was in my dressage saddle so I’m sure I wasn’t pretty…but man, was it fun. When Rob realized it was time to jump she just lit up, and happily galloped over the little fences. I’m calling it a clear round! At this point she was completely pooped and so was I.
Aren’t we a cute team! We each got a short break, then it was time for our actual pace. We didn’t do all of the fences – just the small ones – but I am just so proud of both myself and my mare. 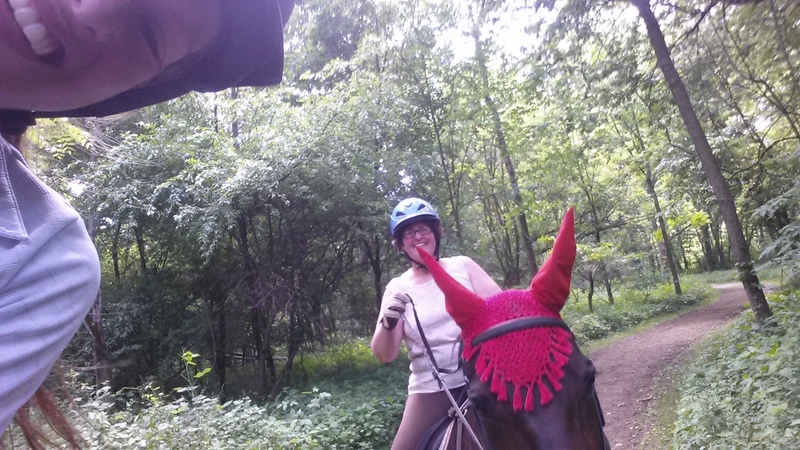 Though she was tired, she was very willing, and offered some gallop even at the end of the 30 minute trail ride. We care more about documentation than winning the pace. Selfie break! 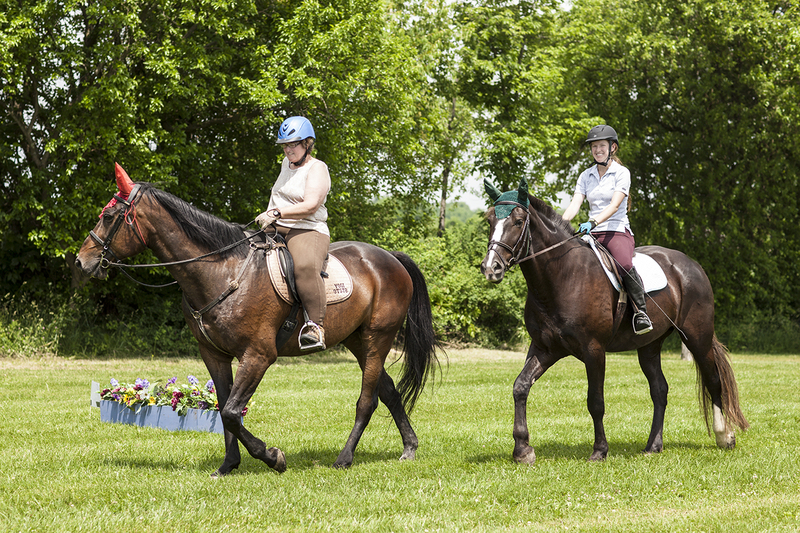 Really, I would have been happy if we had headed home after our dressage school. We got past her new-place-crazies, I got on by myself and worked through her giraffe stage, ending with the quality of work I would expect at home. The fact that we followed that up with a great little jumping round, and then followed that up with a trail ride, and on that trail ride jumped some more!? What a successful day. I was brave. She was brave. We had fun and definitely learned a lot. So… this might sound kind of creepy (and I don’t mean to be creepy, I swear) but that hunter pace was 20 minutes from where I keep my horse! I had no idea you were in the same area as me! Are you going to the New Vocations show this year, btw? What a small world! I have family in Dayton, so I make it out there every so often to visit them. 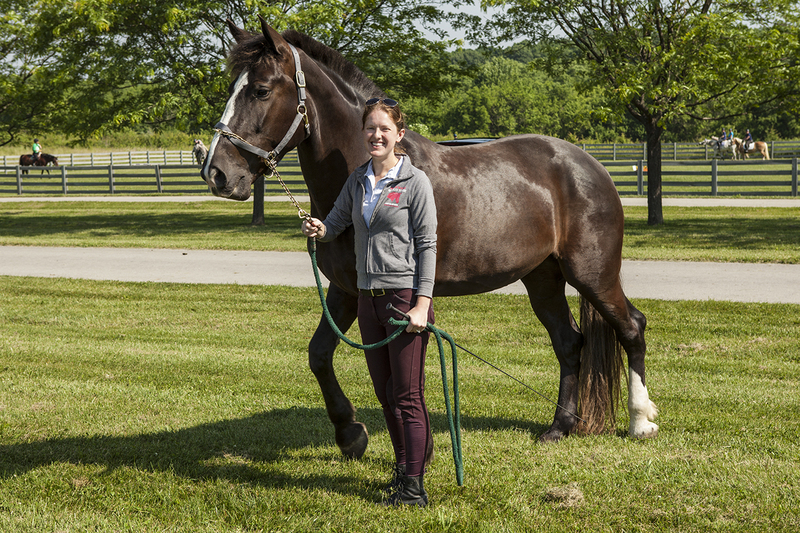 And YES Miles and I will definitely be at New Vocations — will you be there?! i’m actually super impressed by the level of strategy you put into this outing – while being very careful to keep it light hearted and fun. nice! glad it was such a fun and successful day! Great outing!! Sounds very successful.